Tumbled stones measure between 0.5" - 1.5". Tigers Eye is a beautiful form of chatoyant chalcedony that is a pseudomorph crocidolite. This gives the stone the beautiful bands of gold and orange that we know so well. It is usually polished to show off the beautiful colors. 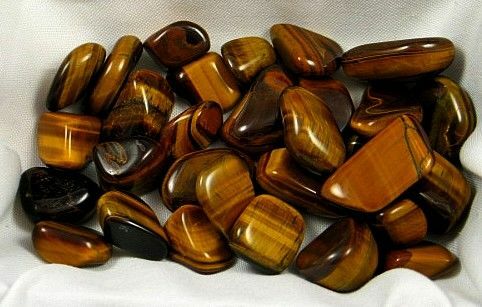 Tigers eye is related to pietersite and tiger iron (which also has hematite and red jasper). It balances your energy by stimulating you when exhausted, or helping you to slow down when you're over stimulated. Its energy is very grounding and protective. Try putting a tumbled stone of tiger’s eye in your shampoo or body wash for days when you need extra protection. 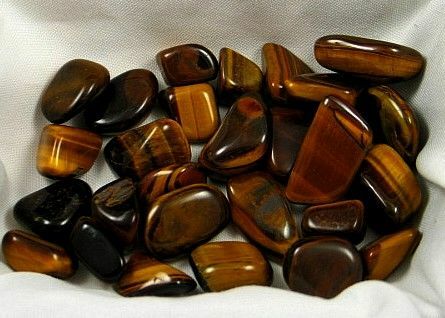 Tigers eye assists to eliminate the blues, and bring brightness and optimism to the user. It also aids in developing intuition and trust of that intuition. Produces soothing energy, helps calm turmoil.